The MILLAC 1000VH, a 5-axis, multiplane machining center, is fast and rigid with a box type bed and a rectangular/wide sliding surface. It achieves stability and precision by utilizing large ball screws and supports with pre-tension. 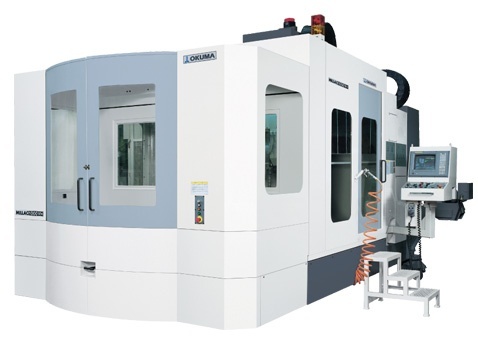 The multi-face machining capability allows for the machining of complex workpieces in one setup, improving part accuracy by eliminating errors while readjusting the part. The 2APC rotary also reduces setup time and increases productivity.